Learn to replace the spark plugs in any car using the Toyota 1.8 liter 2ZZ-GE engine. Spark plugs are an important regular maintenance item, especially for engines like the 2ZZGE. They wear out over time, but can also be fouled very quickly depending on conditions inside you engine. Changing plugs yourself is very easy, it's a good beginner's project. Saving an hour of dealership labor fees, you should be able to buy the tools for less then you'd pay someone else to do the work. Lotus's official maintenance schedule for replacing the spark plugs is every 30k miles or 6 years. This seems very often for Iridium plugs that typically last a very long time. On the other end of the rage, Pontiac recommends you change these plugs at 120k miles. 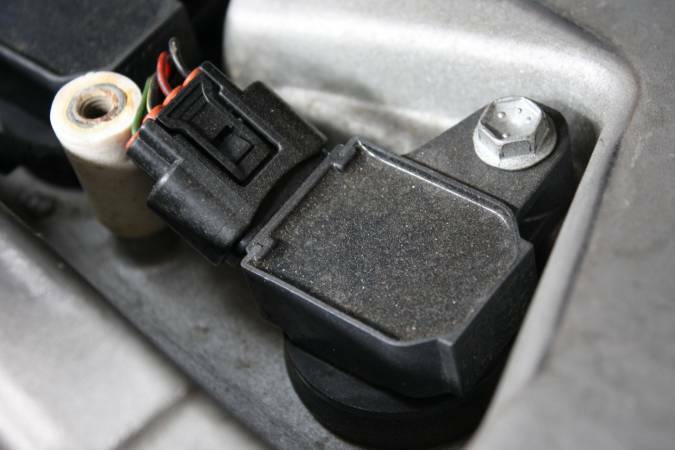 There are no spark plug wires, this engine uses a coil on plug design that uses 4 ignition coils directly connected to the spark plug. As far as spark plug selection goes, forget experimenting with other brands, just get the ones listed below unless you know better. Avoid platinum plugs altogether for boosted applications. The Toyota 2ZZ-GE engine used in a lot of different vehicles. 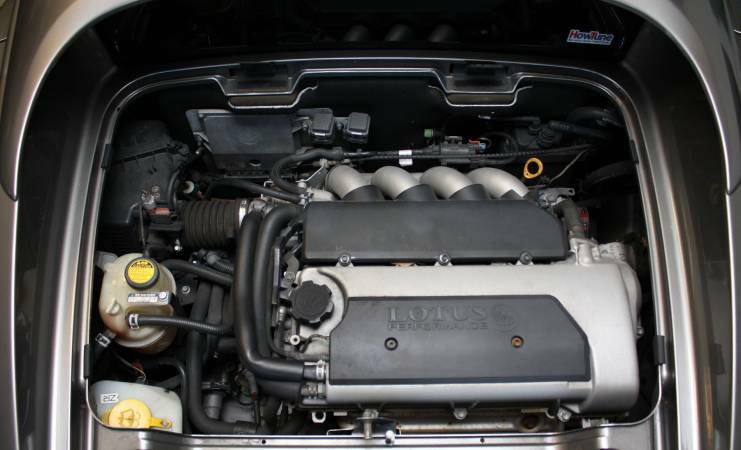 This article shows a 2005 Lotus Elise, but this should apply to any model the 2ZZ is in, differing in minute details like different engine covers. Torque Wrench capable of 80 in-lbs. and ~13 ft-lbs. Use a 5mm allen to remove the two bolts for the spark plug cover. Non Lotus cars will have a large engine cover, remove it with whatever tools necessary. Unbolt each coil's 10mm hold-down bolt so that we can remove the coils. 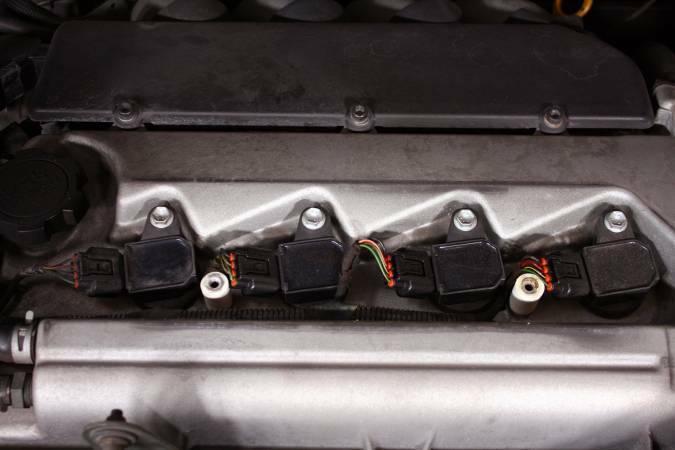 Each coil is has a plastic tube that protrudes down into the cylinder head, connecting to the spark plug. Gently wiggle and pull the coil upward to disconnect it from the spark plug and move aside. You should be able to do this without disconnecting the wire connector at each plug, but feel free to disconnect these if required. Take care not to overly stress the wires on the coil pack connectors. If you have an air compressor or even one of those compressed air computer cleaners, use it to blow out any debris that's accumulated inside the spark plug shaft. This will help you keep it out of the threads. Do this before removing the spark plugs to make sure it doesn't all go down into the cylinder. Using an extension and your spark plug socket, remove each spark plug from the engine. With the iridium plugs I linked to above, don't use the traditional wedge/coin style gap tools like this one. Iridium tips will break, so you have to use the feeler or wire style tools that have tools for bending the side electrode without contacting the fragile iridium center tip. The new plugs come pre-gapped, so you shouldn't need to adjust them. This step is just to assure that they are correct. NGK BKR6EIX-11 (non-forced induction): 0.044"
Install each spark plug. Do not use anti-seize on NGK spark plugs. NGK (and most others) use a special (Trivalent) plating that does not require. Also, anti-seize will affect the torque rating used to tighten them. 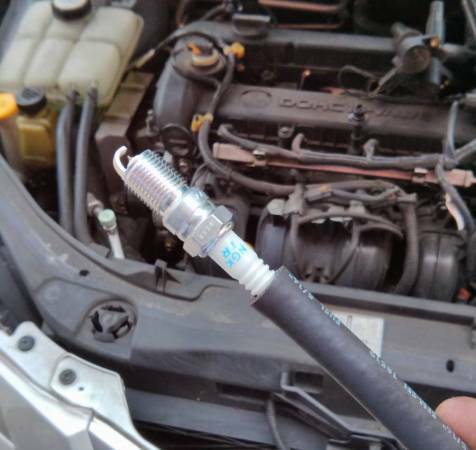 I use a long silicone or rubber hose that fits snugly around the end of spark plug. This allows me to thread the spark plug into the head with better feel then a socket wrench. The idea is to prevent cross-threading the plug. Tighten each to spark plug using the method described in NGK's instructions. New Plugs: seat the plug, then turn 1/2 to 2/3 of a rotation (180-240 degrees). Reusing Plugs: seat the plug, then turn 1/12 of a rotation (30 degrees). Torque is critical to spark plug functionality. Too loose and it won't dissipate heat properly, too tight and it can break. The above method is preferred, but it is worth noting that the Celica 2ZZ-GE service manual calls for 13 ft-lbs. Slide the coil pack back down into the spark plug shaft, pushing down on the center to make sure the coil contacts the plug completely. You may wish to add dielectric grease on the coil boots and shafts. If you're having misfire issues, it looks like adding dielectric grease to the shafts of the coil shafts may be beneficial. Re-install and tighten the bolt for each coil using a 10mm socket. The torque spec is 80 in-lbs. Before you finish the last step, give the new plugs a try. Start up the engine and make sure it appears to be running and idling correctly. If not, double check your spark plug torque and make sure each coil is fully seated. Re-install the spark plug cover or engine cover if you have one. NGK has a youtube video covering spark plug gapping, however they don't do a good job showing exactly how to adjust the gap with the wire gap tool. Instead check out this video showing how to use a wire gapper.